Boy George has never been one to fade away. Since he first appeared on the music scene as the gender-bending, eccentric Culture Club frontman in 1981, George has commanded attention from his fan base, his peers, like his good friend Cyndi Lauper, and the media. Now, Culture Club is releasing “Tribes,” their first album in nearly 20 years, this fall. According to George, the long-awaited release is “the best record we’ve ever made.” While fans wait a couple more months for new tunes, they can get their Culture Club fix during the band’s the “Life Tour” stop at Wolf Trap which includes the B-52s and the Thompson Twins’ Tom Bailey (show details are here). 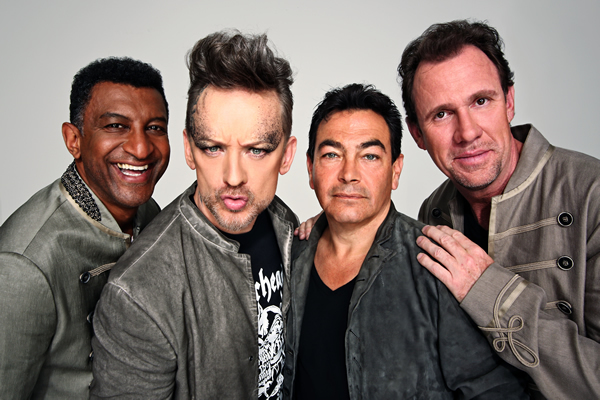 George took a break from recording and touring to chat with the Blade about his passion for astrology, the dangers of social media and just why it took Culture Club almost two decades to release a new album. 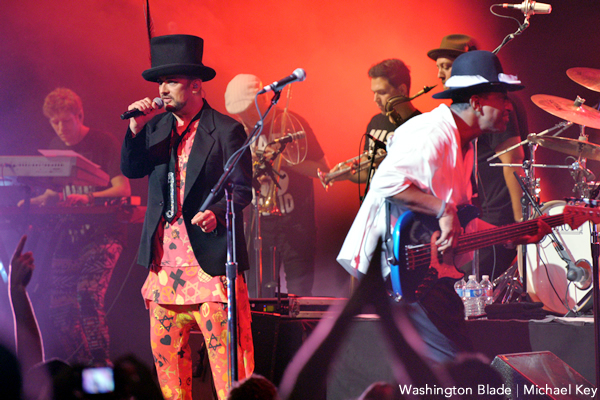 WASHINGTON BLADE: Culture Club is going to be releasing new music for the first time in nearly 20 years. Was there pressure to release new music? 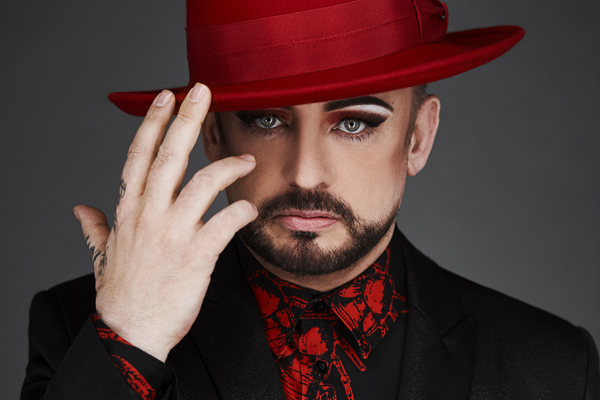 BOY GEORGE: A lot of it has just been that we weren’t working together. The fact that there was a 20 year gap was just accidental. We’re a funny band because we never really split up. We never hated each other at all. We just drifted apart. I was doing my own thing and they were doing whatever they were doing having kids, getting arrested. It’s just one of those things. It’s so weird the way things pan out. This particular record has been probably about five or six years in preparation and then some more problems came up. Not really insurmountable problems, really, just where the band was going. I was looking for a new manager. We disagreed on who was going to be the manager. Jon [Moss], Roy [Hay] and Mikey [Craig] ended up going off with someone else and I found myself a great manager and that’s really what made it work. If you’d had said to me 20 years ago “There’s going to be a point in history where you’ll have two managers” I would have just laughed at you. But, actually, it really works. It’s just a funny thing because all that stuff gets in the way of the most important thing and that is the creativity. It’s really nice that we’re now mixing the record. Every day we’re getting mixes in and I think it’s the best record we’ve ever made. BLADE: What aspects of recording with Culture Club do you prefer over recording independently? BOY GEORGE: It’s a very different process. 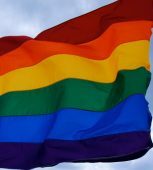 You have to be much more tolerant. I think recording is always free flowing even when you make your own record. You’re still working with people that you respect and love. You let people do their thing. I’m sure there are other musicians who are very controlling and they know what they want. But whenever I go into the studio I know what the song is but I never really know completely where I want it to go. I let a lot of it happen in the moment. I think that’s what makes recording exciting. I would say the same process applies to Culture Club. This time we worked with two young producers and they definitely brought something unique to what we were doing. I really was excited by what they contributed. I would say they were probably more controlling than we were. Bands are crazy and we have no sense of time. Rock and roll people don’t do time. I’ve never worn a watch in my life. I’ve been given some really expensive watches for free but I’ve never really worn one. I think the producer’s job is to come and just control the whole thing and say “OK, we’re going to go this way.” In my experience, recording sessions have always been very respectful, free flowing. It’s just a very open environment. In fact, probably the most fun thing I do is recording. I think that I would probably spend my life in the studio but that wouldn’t be particularly practical. BLADE: I don’t know if you’re into astrology at all but you’re a Gemini and your persona appears to have a duality to it. Have you found that to be a blessing or a curse? BOY GEORGE: First of all, I’m one of those people always talking about star signs. People are like “Shut up!” I’ve always got a lot to say about people’s star signs and how people are so typical of their star signs. I think that’s very true. I think that I’m also very typical of my star sign in the sense that I’m always of two minds about everything. I can come off stage and I could have had a really great show but I’ll also be moany about it. It’s that thing of like the twins and split personality that’s very much a part of who I am. Sometimes people perceive it wrongly. We [Geminis] are called two-faced but we are able to see both sides of every situation. It has nothing to do with being two-faced. We’re very sure about what we feel. But we’re also open to having our minds changed and I think that’s where people get confused about Gemini. So I think that I’m a typical Gemini. BLADE: Concert culture is very different from when you first started out. Now, people are on their phones recording or taking photos when an act is on stage. How do you feel about that? BOY GEORGE: I think it’s fascinating. The last couple shows we’ve done I pointed out people in the front row without phones. I actually made a big thing and said, “Look there are people in the front row without phones. Impossible.” I’m one of those people that believe that people having that attitude all the time is pretty unhealthy. So, there are lots of times when I don’t take my phone with me to dinner. I try not to sit on it all the time. I try to go outside into nature, take a walk. There is a sense that people are having a third party experience with everything that they do and it’s a little bit sad. It’s harder to dance when you’ve got an iPhone in your hand. It’s harder to really let go. I think people are just obsessed with these things. But you’ve also got to let people have the show they want to have. You have to let people have fun on their own terms. So, I’m not one of these people who gets annoyed. I’ve absolutely done it. I’ve stopped shows before, a long, long time ago. And then I turned a corner and was like “You can’t control this. This is not important. This is just going to get in the way.” So I just stopped doing it. It worries me sometimes when people around me just all they do is look at their phones. You know, followers and likes are not for money. It doesn’t mean anything. I come from a time when artists made a cultural impact through the things they said and did. That interests me far more than how many people have liked my photo. But I also know it’s a part of life and a modern phenomenon. I love the aspect that I can say “Happy birthday” to someone in Vietnam or Australia and I can talk to fans in a direct way. It’s all about getting it into perspective, I think. BLADE: You’re such a vet in this industry but what’s the most recent industry lesson you’ve learned? BOY GEORGE: Nobody knows what they’re doing. That’s what I’ve learned. My life policy is basically we’re all clinging to a rock but some of us have a better grip than others. The more I’m in this business the more I’ve realized that with music, we are one of the most creative industries in the world, and yet some of the people running it are deeply uncreative. And I think that’s why live music has become so important for artists like me because it’s the one place where you’re completely in charge. You’re completely authentic even though I hate that word. It’s such a buzz word. But you are in charge. This is me, this is my music. Nobody’s in the way. I love the spontaneity of live shows because it’s really the last place where nobody can pretend to be you. Nobody really gets in your way. I love that and that’s why I think live shows are the best. It’s so great to be in a situation where you can just be yourself.